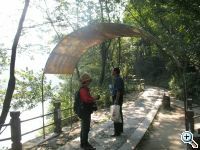 Barbara Beisinghoff dedicates a canopy to Li Bai, 701-762. Overlook at Lushan Fall Over the burner mist rises in the sunshine, / On the hillside afar, a fall seems to lie. / The 3000-foot-long fall is straight to fly. / Is the Milky Way falling from the sky? The roof of the bridge is of seven perforated copper- and brass-plates on a construction of steel tubes. From the bridge you overlook a waterfall and the Yellow Dragon Pool. The underside of the canopy appears dark with holes of light and forms a galaxy of stars. According to Li Bai’s time Barbara Beisinghoff chose the Kitora Kofun Sky Map from the late 7th/ early 8th century as a model for the four plates representing the four seasons. The middle section shows the Dunhuang star map with »asterisms« (clusters of stars), dating from the Tang Dynasty. This roof does not protect anybody in contrary it consists of filigree patterns of holes and directs the perception to the cycle of time and infinity. Barbara Beisinghoff specializes in etching, artist books, installations of watermarked papers and waterjet performances. In her hometown, Dreieich, near Frankfurt, she worked on one project with 250 children, whose drawings - etched into copper reliefs - are embedded in the pavement around the town hall. Beisinghoff, born in 1945, studied Fine Arts in Hanover and has received several art prizes, such as the Mainz City Printer Prize, the Heitland Foundation- Prize, the Senefelder Prize for Lithography and the Georg-Christoph-Lichtenberg-Prize for Fine Art.. As artist in residence she has visited Belgium, Austria, Sweden, Israel, Canada, Peru and Guanlan Print Base, Shenzhen, China and has lectured and taught workshops in South Korea, Canada and Peru. Beisinghoff exhibits her artwork regularly. Her works are collected by international museums, such as the National Museum of Women in the Arts, Washington, USA.